Mercedes is a teacher and president of the Puerto Rican Teachers Federation (FMPR), a union fighting to defend the rights of Puerto Rican teachers and for accessible, quality public education for students. The FMPR organized brigades of teachers and community members to clean up schools after Hurricane Maria and demand their reopening. The FMPR is a key organizer of the movement against school closures and is resisting the moves of disaster capitalism to privatize education and other public institutions and take over Puerto Rico. Watch here! Renee is a human rights and community development lawyer and Director of the Community Enterprise and Solidarity Economy Law Clinic at John Marshall Law School. Her work and research focuses on strategies to build power and create equitable development practices and healthy neighborhoods in predominantly Black, low-income communities. She's written on topics related to the systematic economic violence of Black life, the connection between gentrification, displacement, and school closings, and Black economic solidarity in education. She is the national co-chair for the US Human Rights Network Working Group on Equality and Nondiscrimination, co-chair of the Association of American Law Schools Clinicians of Color Subcommittee, and a member of Law for Black Lives. Watch here! Joan is a community organizer. She has participated in and led struggles to improve public education, resist police violence, contend for grassroots-led political power, and secure and improve long-term affordable housing. Through her organizing, Joan recognized that many of the barriers to community participation stemmed from a lack of access to quality jobs and ownership of their own labor. People have material needs that current movements cannot continue to ignore if they seek to grow. Thus, Joan co-founded the Cooperation for Liberation Study & Working Group to understand and build worker cooperatives as a tool for economic independence and self-determination in Black communities. [Note: You do NOT need to register for workshops in advance...but YES register for the CF! 1. Continuing the Conversation with Mercedes Martínez (Keynote Speaker). This workshop will continue the conversation with Mercedes. It will specifically address how all of us in Chicago and the US can support the struggles of the Puerto Rican people-to resist disaster capitalism and to reclaim and reimagine a Puerto Rico for the people. 2. Youth Are More Powerful Than Ever (Adult supported- Gigi & Aidé, Teachers for Social Justice; YOUTH LED, Xóchitl). Youth are powerful and will organize together as they voice their struggles in their schools, communities, and world. Adults will support them as they discuss an action they would like to take as they continue to work together in the future. 3. Students Not Suspects: Anti-Muslim Surveillance in Schools (American Friends Service Committee; Brianna Hanny, Zareen Kamal, Nicole Nguyen, Mary Zerkel). Fear of terrorism is used to justify the racial and religious profiling, and the Department of Homeland Security relies upon the cooperation of teachers and school social workers to implement surveillance programs in schools that criminalize Muslim and other marginalized youth. We will help participants to recognize these programs, see connections with other forms of surveillance like the gang database, and come up with concrete strategies to resist. 4. $95 Mil for Communities! (#NoCopAcademy). It's been a year since #NoCopAcademy hit Chicago, demanding money for schools and communities not more policing. Attend this workshop to hear from youth leaders active with the campaign about lessons learned, where we're at now, and how you can get involved. 5. Black and Brown Parents United for Education Equity (Irene Robinson & Jitu Brown, Kenwood Oakland Community Organization & Journey for Justice Alliance; Carmen Cabrales, Family Focus Hermosa Community). This past year, parent/family leaders from various Chicago neighborhoods have met to share stories about struggles for equity in their children's schools/communities. Black and Brown parents showcased their efforts, successes, and support for each other's work across communities. This workshop will have several parent leaders whose lives have been transformed by their struggles. Parents, families, and supporters will get to hear stories and discuss lessons learned and future plans in the movement for education equity. 6. Chicago Childcare Collective Volunteer and Values Training (Chicago Childcare Collective [ChiChiCo]). Radical Childcare Volunteer Training- join Chicago Childcare Collective organizers for an introduction to their collective's model for liberatory play, anti-adultism, and childcare activism. Participants will review ChiChiCo's values and consider the work that it takes to enact these values while providing childcare in organizing spaces. Participants will also have the opportunity to observe ChiChiCo members working in the childcare space after the workshop and to join the collective as volunteers. 7. Building Critical Thinking Through Classroom Conversations With Documentary Film (Bill Siegel, Projecto Willis LLC). Teachers will engage in an interactive session using The Vietnam War documentary series as a model for integrating non-fiction media into classroom discussion. Teachers will experience how the kinds of questions they ask, greatly impact the challenge they give to students to authentically express their ideas and opinions and build respect and consideration for alternative points of view. Teachers will come away with specific strategies to facilitate rigorous, open-ended, text-based discussions of non-fiction media. 8. Justice-Centered Teaching in Middle School (Jessica Suárez Nieto & Alejandra Frausto, Teachers for Social Justice). In this workshop participants will be a part of an interdisciplinary mini-lesson that will model how to engage middle schoolers in justice-centered learning. Participants will get an opportunity to engage in a dialogue with the presenters about how to create curriculum in math, science, history and language arts while also developing strong classroom communities. Presenters will also reflect on what led them to teach in this way and the journey of continuing to teach this way. 9. What Is Gentrification? (Obama Community Benefits Agreement Coalition).Displacement and gentrification are terms that have become associated with development in low-income and working communities. Unfortunately, however, there is a lot of confusion regarding what these terms mean, and whether development is possible without displacement. This workshop seeks to unpack these issues, and place them in the context of a local fight for a community benefits agreement as a means to preserve community in the midst of development. 10. Black Muslims in U.S. History: An Introductory Activity (Alison Kysia, Teaching for Change). In this interactive lesson, each participant receives a ½ sheet biography of a Black Muslim who lived in the U.S. between 1600-present. Participants mix and mingle for 25 minutes, introducing themselves as their Black Muslim character. Afterwards, small group discussion highlights the important themes emphasized during the activity. This is the first of a seven-lesson curriculum called "Islamophobia" A people's history teaching guide" at Teaching for Change. 11. Empowering Yourself with Data (Sarah Rothschild, Chicago Teachers Union). This workshop will teach participants how to find important public data about the Chicago Public Schools in order to advocate for more resources for their schools. I will show everyone where some of the really important data is located within the CPS website and provide a brief Excel tutorial to help participants analyze and summarize the data. This is a hands-on workshop and it is recommended, though not essential, that people bring their own laptops. 12. Struggling Against White Supremacy as a White Educator (Maura Nugent, Kayce Bayer, Martin Carver, Jonah Bondurant, Liz McCabe; Teachers for Social Justice). This session is designed for white educators interested in confronting the effects of their whiteness in the classroom and working with other white educators to help further anti-racist initiatives in our schools and communities in coalition with people of color. We welcome anyone who wants to think through ways to challenge the silence around race, power, and white supremacy in the classroom and in our schools. 13. #PoliceFreeSchools (Olivia Abrecht, Andrea Ortiz, and youth leaders from Brighton Park Neighborhood Council). 1.6 million students in the U.S. attend a school with no counselors, but with police. In the last three years, there were over 30 assaults by police officers in schools. The U.S. DOJ report on CPD documented abuse by police officers in CPS. Chicago's Inspector General found that police operate without accountability or oversight in schools. In this workshop, we reimagine school cultures without punitive discipline and explore dismantling school policing. 14. Title IX Rights: Supporting and Protecting Young People (Darien R. Wendell and Illinois Caucus for Adolescent Health youth facilitators). Did you know that Title IX rights apply to high schoolers? Join high school student facilitators and the Education Specialist of the ICAH to learn about protections for students who are pregnant, parenting, trans, gender nonconforming, and/or survivors of sexual violence. Practice responding to Title IX violations through participatory scenarios and walk through Office of Civil Rights and CPS reporting processes to help ensure the success of ALL students. 15. 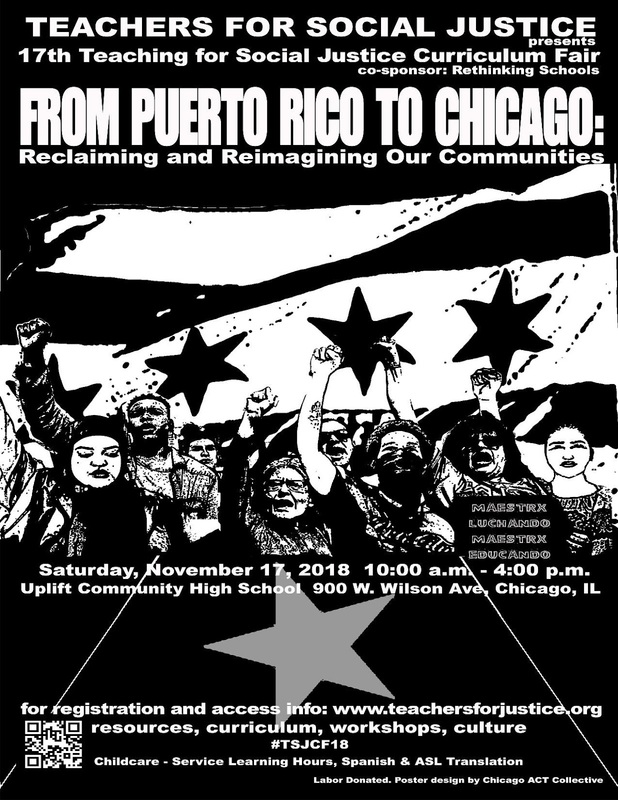 The Puerto Rico Solidarity Brigades: Bridging our Communities for Social Change (UIC-College of Education, CTU-Latinx Caucus, Chicago Boricua Resistance). Six months after hurricane María twenty students, teachers, and community activists went to Puerto Rico to engage in solidarity work with mutual support centers, teacher unions, and organized communities. This is a report back on the solidarity work done and in process as part of a broader vision connecting movements for social justice across nations. Brigadistas and coordinators will speak to their experiences and open up a space for imagining next steps in broadening solidarity. 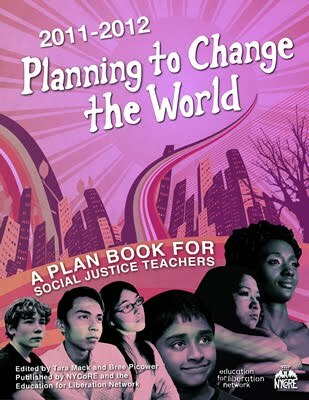 Are you a teacher who would like to present your curriculum at the Teachers for Social Justice Curriculum Fair? If you’re feeling a bit nervous or hesitant to do so, please watch this video! And then submit a proposal here!